The European Union has filed a complaint against Google over its alleged anti-competitive behaviour. The competition commissioner said she had issued a "statement of objections", stating that the firm's promotion of its own shopping links amounted to an abuse of its dominance in search. The firm said it "strongly disagreed" with the allegations and looked forward to making its case. Ms Vestager also revealed that she had launched an investigation into whether the way Google bundled apps and services for its Android operating system was unfair. The European Commission has investigated the antitrust allegations - made by Microsoft, Tripadvisor, Streetmap and others - since 2010. Among their complaints was an objection to Google placing adverts from its Shopping service ahead of others' links in relevant searches. Ms Vestager said the Commission's preliminary findings supported the claim that Google "systematically" gave prominence to its own ads, which amounted to an abuse of its dominant position in search. "I'm concerned that Google has artificially boosted its presence in the comparison shopping market with the result that consumers may not necessarily see what's most relevant for them, or that competitors may not get the the commercial opportunity that their innovative services deserve," she told a press conference in Brussels. Ms Vestager said that she was not seeking a wider redesign of Google's search results or asking it to change its algorithms. But she added that the case could set a precedent that would determine how the EU handled other complaints about Google favouring its own mapping, hotels and flights services. 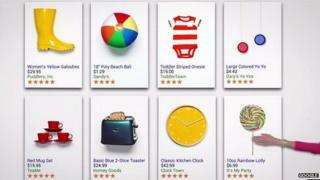 Google has rejected the idea its Shopping service distorts the market. "While Google may be the most used search engine, people can now find and access information in numerous different ways - and allegations of harm, for consumers and competitors, have proved to be wide of the mark," wrote its search chief Amit Singhal on the firm's blog. "It's clear that: (a) there's a ton of competition - including from Amazon and eBay, two of the biggest shopping sites in the world and (b) Google's shopping results have not the harmed the competition. "Any economist would say that you typically do not see a ton of innovation, new entrants or investment in sectors where competition is stagnating - or dominated by one player. Yet that is exactly what's happening in our world." Many of Google's rivals welcomed the EU's action. "Google's abuse of dominance distorts European markets, harms consumers, and makes it impossible for Google's rivals to compete on a level playing field," said lobbying group Icomp. "We see this statement of objection as a crucial first step towards ensuring that European consumers have access to vibrant and competitive online markets." "These issues are distinct from the Google comparison shopping case and the investigations will of course be different," Ms Vestager said. In response, Google stressed that Android devices could be offered without its services. "It's important to remember that [our partner agreements] are voluntary - you can use Android without Google - but provide real benefits to Android users, developers and the broader ecosystem," said lead engineer Hiroshi Lockheimer. "Our app distribution agreements make sure that people get a great 'out of the box' experience with useful apps right there on the home screen. This also helps manufacturers of Android devices compete with Apple, Microsoft and other mobile ecosystems that come preloaded with similar baseline apps." Google could ultimately face huge fines and be ordered to reshape its business in Europe because of the shopping complaint. In recent years, the Commission has imposed antitrust penalties on other tech giants, ordering Intel to pay €1.1bn (£793m; $1.2bn) in 2009, and Microsoft €516m in 2013. However, Ms Vestager said she was "open" to Google's response, and would listen to its case before deciding how to proceed. One independent expert said that the matter could take years to resolve. "I can't see that this will be a fast process given the complexity of the subject matter, what's at stake and the likely level of the fine," said Paul Henty, a lawyer at Charles Russell Speechlys who has previously worked for the European Commission. The EU's investigation is not the only one Google is facing. Investigators at India's Competition Commission delivered a report last week after carrying out a three-year probe into claims of unfair business practices. Their counterparts in Russia, Brazil, Argentina, Taiwan and Canada have also opened investigations. However, the US Federal Trade Commission dropped its own probe at the start of 2013 after Google made several non-binding commitments.